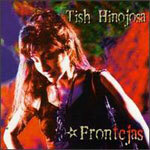 Tish Hinojosa's musical star is continuing to rise. With the clearest voice this side of Judy Collins, a knack for writing catchy songs and a smile that can light up an auditorium, she's a superstar in waiting. Her only problem  if you want to call it a problem  is that her musical taste and talent range so broadly that she's impossible to categorize. Is she country? Yes. Folk? Absolutely. Latin? Yup. You can see why radio programmers don't know what to do with her. Hinojosa's latest album, "Frontejas," is a collection of Mexican folk and contemporary songs dedicated to her late mother, Maria, whose own dreams of a singing career were short-circuited by the necessities found in raising a family. Unlike her last two albums, "Destiny's Gate" and "Culture Swing," which both featured country-flavored songs in both English and Spanish, "Frontejas" is all in Spanish. English translations of the lyrics are provided  though given the stunning beauty of the music, most folks won't be spending much time doing any reading while this is playing. Especially moving is Hinojosa's duet with accordionist Flaco Jimenez on "Dejame Llorar." Nearly as touching is a duet with Peter Rowan on their song, "Solo Tus Ojos," with just Rowan's acoustic guitar and their two voices.